For as long as I can remember Cookies has been moaning how much he misses certain dishes from US. Some of those foods I managed to make, like Sloppy Joes or Dirty Rice. 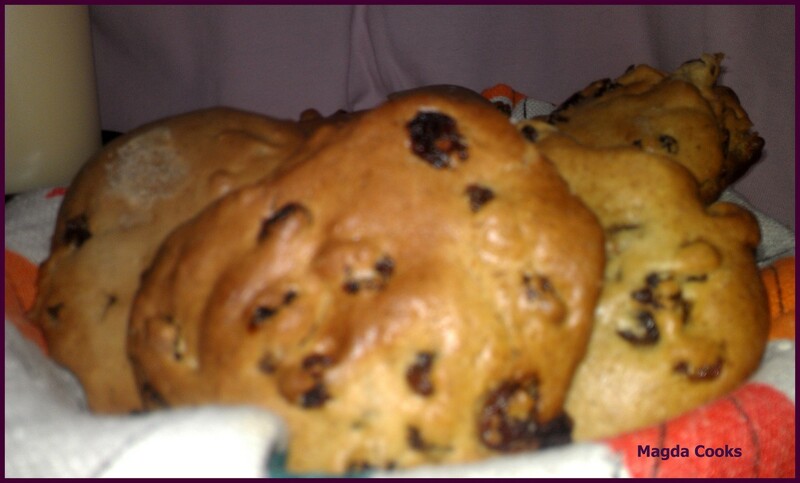 But one of his Holy Grails is Cinnamon Raisins Buns (or bread). He was looking for it in every new bakery we stumbled across but unfortunately it could not be found anywhere. So when I got my halogen oven I decided to give it a try. And as it occurred it was extremely tasty experience. You would have to see his face when I gave it to him 😉 Priceless!! Combine flour, brown sugar, cinnamon and baking powder. Chop butter into cubes (for easier mixing) and add to flour. Beat together eggs, vanilla and milk, add to dry ingredients and stir just until thoroughly blended. Add raisins. With a tablespoon put blobs of dough onto greased baking sheet. Bake at 165°C for 20-25 minutes or until light golden brown. Original recipe says to serve warm, but anyway you choose, it tastes awesome!